The iRobot Create 2 is an update to the original Create -- a reprogrammable Roomba robot vacuum cleaner for robotics hobbyists, educators and researchers. Out of the package, users can use their PC to control the robot by sending and receiving byte code sentences over a wired serial-USB connection. However, the native open interface is geared to the advanced user, and not well suited to rapidly developing code. This toolbox provides a set of intuitive, high level functions (a.k.a. wrappers) that allows you to easily control the Create 2’s sensors and actuators from a PC running MATLAB. Even novice MATLAB users should be able to get the robot running within 10 minutes. The original MTIC toolbox has been has been downloaded 1000's of times by students, researchers and educators from universities all over the world. What is new for Create 2 and MTIC2? Create: You need an iRobot Create 2. 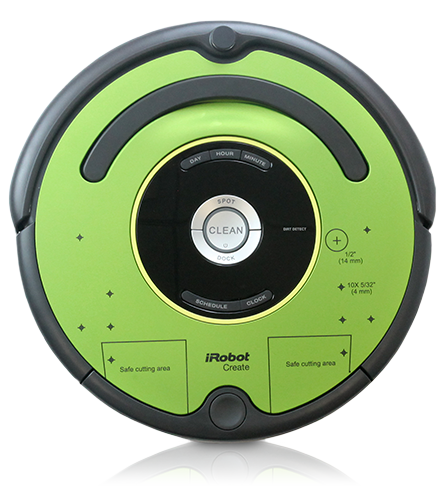 The Create 2 is based on the physical platform of the Roomba 650. The toolbox was developed based on the Create Open Interface document dated August 10, 2015. There are some known issues on robot with firmware lower than 3.3.0. You can check the firmware using the CheckFirmware function included in this toolbox. Matlab: The toolbox was developed and tested with MATLAB Release 2015a. Earlier versions were tested on releases dating back through 2008 and will likely work properly. The toolbox has not been tested on Mac or Linux/Unix versions of Matlab or its freeware clones, though it is likely to work. PC: You need a PC or laptop since all the code you create with this toolbox will be stored on and run on a PC, and the commands will be sent to the robot via a communication cable. The toolbox does not allow you to write code which is stored on or runs directly on the robot. Connection: The USB to Mini-DIN communication cable included with the Create2 is used to create a wired data connection to a PC. At the time of this release two add-on products exist for creating a wireless connection: RooTooth and RooWifi. Looking for the original MTIC? The MATLAB Toolbox for the iRobot Create2 was developed by Professor Joel Esposito. at the United States Naval Academy in the Systems Engineering Department. Owen Barton, Joshua Koehler and David Lim all contributed to the original MTIC while supported by the ASEE/ONR SEAP program, which provides high school students an opportunity to work in a Navy Laboratory.